Here at Bound State our goal is to help business win, serve, and retain customers. We strive to do this by delivering compelling, simple to use, and personalized customer experiences. Great applications provide great customer experiences that attract and retain customers. That is why we love it when brands go out of their way to provide awesome experiences for their customers. The new YYoga apps, which are self service portals to track and reserve yoga classes are great examples. These customer portals do a great job serving and retaining customers. They provide great value for their customers. How do these apps help YYoga customers? Two YYoga features that stand out are the fitness tracker and the goals. Even though both are quite simple, they are nonetheless useful. The fitness tracker keeps records of all the classes you’ve attended per month and displays them on a chart. The goals feature enrolls you into a fitness challenge. These new fun dashboards are sure to inspire people to achieve their fitness goals. 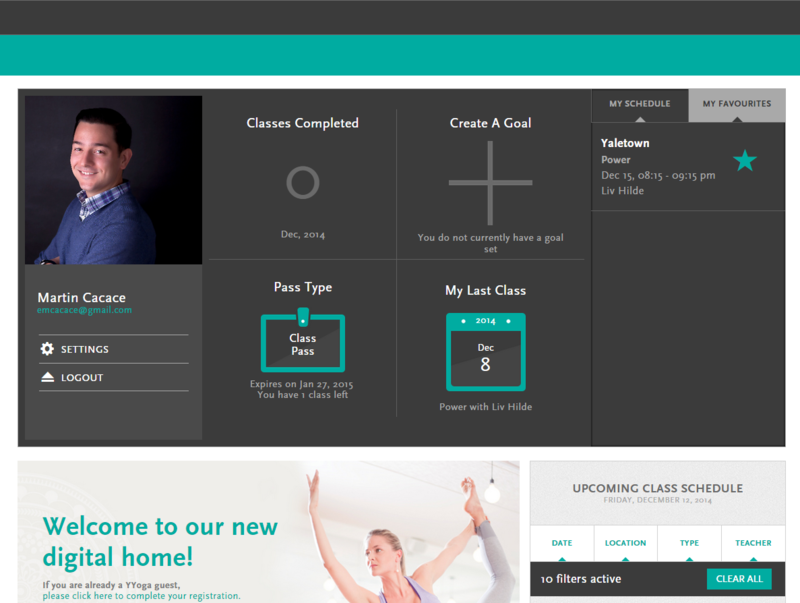 YYoga makes it easy for customers to track current passes and what classes they’ve attended. It’s easy to favourite classes a customer has liked and find similar classes to reserve in the future. Finding the right Yoga instructor can be difficult, so having the ability to save and filter by instructors is useful. It would be cool if one could rate these instructors and classes (even if those ratings are kept private) so that one could easily filter classes better or even get recommendations! The home page displays all of the important information in one convenient place. This lets customers stay on top of events, promotions and tips. Having frequent updates, events and the ability to interact with the brand strengthens the community and keeps the YYoga brand growing. YYoga is a great example of a business with ambitious missions using technology to create value for their customers. What is your business currently doing to serve and delight your clients? What businesses inspire you through their customer minded approach?